We are using a small part of the car energy to produce Hydrogen. When we add this hydrogen to our normal fuel inside the engine, the energy released in the combustion chamber is much higher than usual, resulting in a important reduction of fuel consumption! 4. As the specific heat ratio increases, the cycle thermal efficiency also increases, which gives the potential for better fuel economy. CALTECH - California Institute of Technology also made some Researchs calculating the thermal efficiency on system fuel economy using supplemental hydrogen. The overall engine efficiency increases and is more dominant than the energy loss incurred in generating hydrogen, resulting improved fuel economy for the system as a whole. 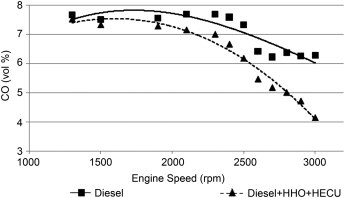 An average of 19.1% increment in engine torque is obtained using HHO compared to pure diesel operation. The increase in power is due to the oxygen concentration of HHO gas and to a better mixing of HHO with air and fuel that yield enhanced combustion. The results show that the addition of HHO can signiﬁcantly enlarge the ﬂammable region and extend the ﬂammability limit to lower equivalence ratios. 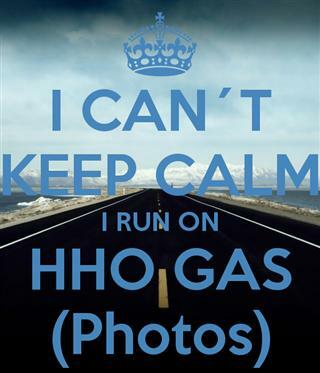 Since HHO gas has a low ignition energy and fast ﬂame speed, the HHO+Diesel mixture can be more easily ignited and quickly combusted than the pure diesel fuel. Thus, improved torques at high speeds can be obtained. High laminar ﬂame velocity of HHO yields decreased ignition delay and shortened combustion period providing lower heat losses, much closer to ideal constant-volume combustion which results increased compression ratio and thermal efﬁciency. The result is lower engine temperature. High burning velocity of hydroxy provides faster increment in pressure and temperature which may minimize the knocking especially at idle conditions (low or no load). Also, ignition delay period reduction yields diminished engine noise. 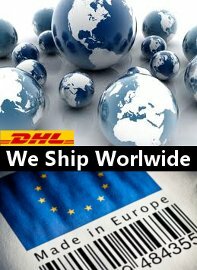 An average gain of more than 20% is achieved on SFC-Speciﬁc Fuel Consumption by using HHO System. The reduction in fuel consumption is due to uniform mixing of HHO with air (high diffusivity of HHO) as the higher presence of oxygen which assists diesel during combustion process and yields better combustion. 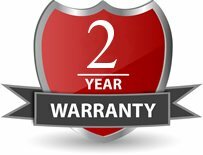 The higher savings occur at high speeds because diesel fuel is hard to be completely burnt at lean conditions due to the increased residual gas fraction and poor mixing. Since HHO gains a high ﬂame speed and wide ﬂammability, the addition of hydrogen will help the fuel to be burned faster and more complete. An average reduction of 13.5% is gained at CO emissions at mid and high engine speeds. The absence of carbon in HHO gas is a major reason for CO reduction. Wide ﬂammability range and high ﬂame speed of HHO gas ensure engine to be operated at lower loads. 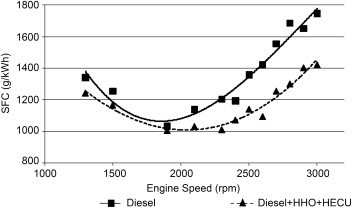 The HHO+diesel fuel mixture burns faster and more completely than the pure diesel fuel. Thus, CO emission at high speed and lean conditions is effectively reduced after HHO addition. Since HHO gas contains oxygen, higher combustion efﬁciency is obtained and CO emissions are lower.